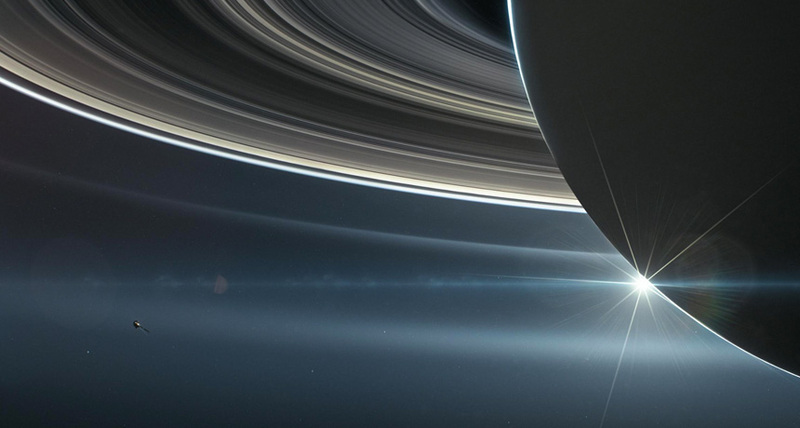 Saturn’s rings are painting its innermost moons. Data from NASA’s now-defunct Cassini spacecraft show that five odd-shaped moons embedded in Saturn’s rings are different colors, and that the hues come from the rings themselves, researchers report. That observation could help scientists figure out how the moons were born. Saturn has more than 60 moons, but those nearest to the planet interact closely with its main band of rings. Between December 2016 and April 2017, Cassini passed close to five of these ring-dwelling moons: ravioli-shaped Pan and Atlas (SN Online: 3/10/17), ring-sculpting Daphnis and Pandora (SN: 9/2/17, p. 16) and potato-shaped Epimetheus. The flybys brought Cassini between two and 10 times closer to the moons than it had ever been, before the spacecraft deliberately crashed into Saturn in September 2017 (SN Online: 9/15/17). Examining those close-ups, Buratti and her colleagues noticed that the moons’ colors vary depending on the objects’ distances from Saturn. And the moon hues are similar to the colors of the rings that the objects are closest to, the team reports online March 27 in Science.